Every year, I bake a pumpkin pie for Halloween. It has become a tradition with my family and friends. I have always loved this dessert and I can easily say it is my favorite pie. Perhaps it’s because I never really liked pies or cakes and this pie seems to fall outside the typical sweet category. Every year, I experiment with the recipe. I have to say the quinoa crust has been my favourite and constant. What I have changed about the pie this year is the substitution of brown sugar to rice malt syrup as well as cream to coconut cream. I always had problems digesting the cream and would make the pie for other people knowing that I couldn’t have any…so sad really. So the change to coconut cream was an exciting discovery. However, the change from brown sugar to rice malt syrup was a biggie. In my efforts to cut out sugar, I have experimented with many natural alternatives, but with my fructose intolerance, the only logical substitution was to use rice malt syrup. 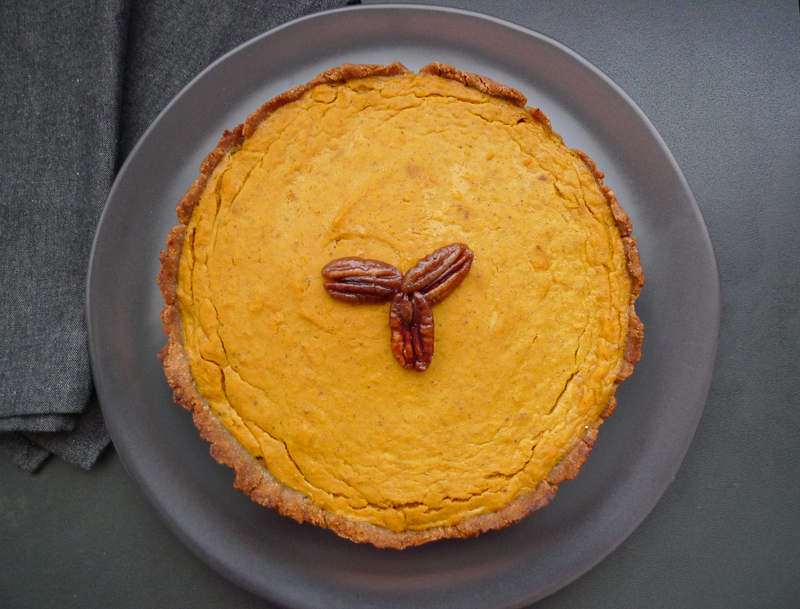 This pie isn’t as sweet as the pies of my past, but in saying that, the deletion of sugar allows the pumpkin to stand out. 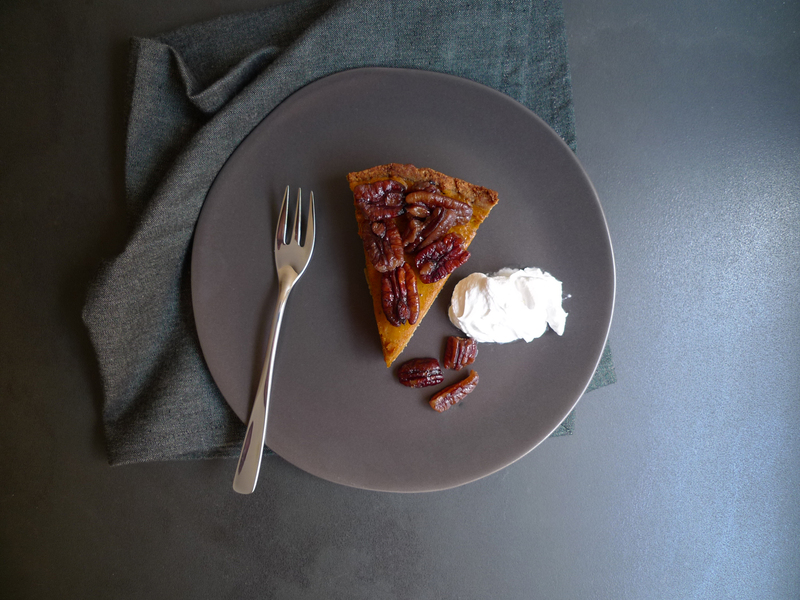 Topped with some ‘sugared’ pecans and coconut whipped cream, this is truly a good pie; perfect for autumn or even a beach Halloween. 1/2 cup (125g) margarine, melted and slightly cooled. Preheat the oven to 180 C / 350 F. Prepare the pie crust, then set aside to prepare the filling. Combine the quinoa, tapioca flours, and cinnamon in a medium bowl and mix well. Blend in the melted margarine. Add the water and use your hands to form a soft dough. Press evenly into a lightly greased (or papered) pie tin. Bake the shell empty on the centre oven rack for 10 minutes. If the centre begins to bubble, use fork to lightly break in the centre of the shell. Allow to cool completely before adding a filling. Remove the skin from the baked pumpkin and blend until smooth. Whisk the pumpkin, eggs, cream and syrup in a medium bowl. Add the spices and vanilla to combine. Pour into the pie crust. Bake for 40-45 minutes. The centre should be firm but soft. Let the pie cool completely before serving. – Rice malt syrup was used as a no-fructose sweetener option. You can use alternative natural sweeteners such as organic honey or maple syrup or 3 fresh pitted dates.